Our economy package of Dailies Total1 Multifocal lenses contains 90 lenses. These daily, silicone-hydrogel lenses are produced by Alcon and have an exceptionally high level of oxygen permeability to ensure comfortable and healthy wear without redness. Dailies Total1 Multifocal are daily, silicone-hydrogel contact lenses from producer Alcon. They have a variable water content. Their production technology combines classic hydrogel material, which contains a high amount of water, with silicone-hydrogel, which provides the necessary oxygen permeability to the cornea. Both materials enhance the comfort of wear. This package contains 90 lenses. 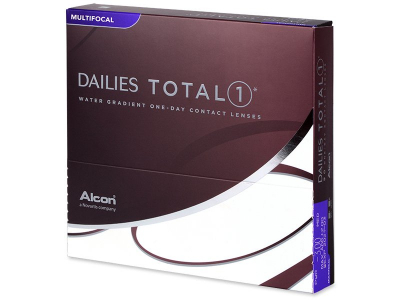 Read more about Dailies TOTAL1 Multifocal contact lenses. Probably the best daily multifocal lenses i've worn. Hi, Carole, Please contact our customer service.